Wells and Young’s | Beer Apprentice - Craft Beer News, Reviews, Interviews and Info. Hi guys. For today’s craft beer review I’m going to be trying the Well’s Bombardier produced by the Well’s and Young’s Brewing Company located in Bedford, United Kingdom. It’s been some time since I last had a beer from Well’s and Young’s, but I’ve always thought that they make some solid and true to style beers. Plus, I’ve never tried this one before, so why not give it a shot? From the website, wellsandyoungs.co.uk, I found this bit of info about the Bombardier. 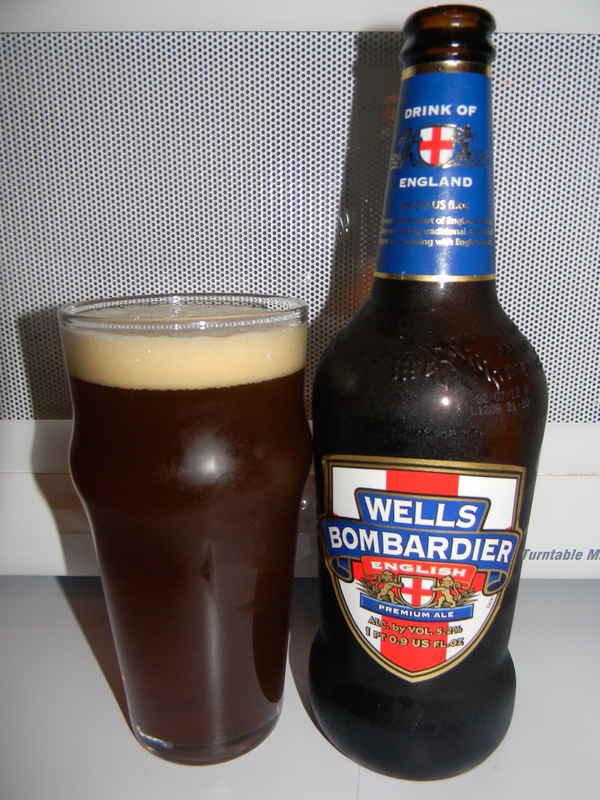 Bombardier is an iconic real beer loaded with distinct English brilliance. It’s the epitome of impeccable taste and great character. The rich, full-bodied nectar is a lingering reward – English, ever reliable and damned tasty! I’m ready for a sip. This brew put forth an ABV of 5.2% and it came in a 16.9 oz. bottle. It poured a mostly clear, amber color with some burnt orange highlights glistening around the edges of the nonic glass. A small, smooth, creamy and soft egg shell colored head was formed from a relatively gentle pour. The retention time was ok and the lacing wasn’t all bad either. The nose released a sturdy dose of caramel malt with some lightly toasted breads and biscuits. It had some type of fruity aroma too. Like a some kind of dark fruit or something. That’s about all I could decipher to be honest. It was well balanced and fine, however somewhat straight forward and simplistic. The taste was a lot like the aroma. Savors of caramel malt fused with subtle toast and bread aspects. It had a delicate and much enjoyed earthy bitterness as well. Just a little tickle to let me know it was there. The dark fruit characteristic was discovered again. It was more defined in the taste as it seemed to take on a light raisin sensitivity. The mouthfeel was medium bodied. Smooth, slick, kind of creamy and just a tad bit chewy. It wasn’t altogether dry and the carbonation leaned toward the lower side. An ok amount of flavor was left behind after each sip for enjoyment too. Overall, I found this to be a well made and enjoyable beer. It doesn’t really impart anything out of the ordinary, but rather it’s a well balanced, lightly complex and easy drinking beer. I wouldn’t mind having this brew again sometime that’s for sure. I can’t say that I would go out searching for it, but if I saw it on the shelf and I wanted a sturdy beer that could be enjoyed year round…. I’d grab it. It certainly is a lot better than some of the alternatives out there. Have you guys ever had the Well’s Bombardier? What was your impression? Did you like it? Would you drink it again? Feel free to leave a comment and tell me about it if you would like. Tonight, I have a special beer to review. As I’ve said before, I’m a chocolate beer lover (I’m not ashamed to admit it) and everyone I talk to says that this is the beer for me.I’m going to have, for the very first time, a Young’s Double Chocolate Stout from the Wells and Young’s Brewing Company located in Bedford, United Kingdom.This is supposed to be the chocolate brew that sets the standard for this style. The website, wellsandyoungs.co.uk, has a full description of this special brew. Unsurprisingly for a beer from the Young’s stable, Double Chocolate Stout has been recognized as an award-winning brew on several occasions, including: Brewing Industry International Awards Gold Medal Winner 2000, Silver Medal Winner 2002 and Bronze Medal Winner 1998 and 2004. That’s quite a positive description. I bet it’s good. Let’s see. This 11.2 oz. bottle comes in at a modest 5.2% ABV. The appearance was a very nice dark brown/black color with the usual ruby highlights around the edges. The pour produced a light tan head that was of good size, smooth and mostly creamy. Obliging retention, which settled to a nice ring on top after a few minutes. After the head receded, I was left with some satisfactory lacing on the glass. Not too much, but plenty for an aesthetic appeal. The aroma was a nicely balanced combination of milk chocolate, roasted malt, dried oats and a touch of roasted grain. All harmonized well with each other and only furthers the temptation to take a sip. I’m not waiting any longer. The taste revealed the rich chocolate of course, but it also provided the roasted, malty oats and grain that had a resemblance to some type of Belgian grain. A milky taste combined with slight touches of a plum essence hide in the background to only add to the sweetness. A touch of chalkiness completes the savor. I only found minor tones of bitterness, but it was still well balanced and good. The mouthfeel was medium to medium/full. Very, very smooth and easy drinking. Nicely dry and creamy. I was a little disappointed in the aftertaste. It was ok, but I was hoping that it would leave a silky film of flavor on the tongue and throat that begs for another gulp, however it lacked a little in that department. I must say that this beer is very good, very enjoyable and very easy to drink. Almost too easy to drink to tell you the truth. It does exhibit all the proper characteristics of a Chocolate Stout, although considering all the hype that surrounds this beer and all that I’ve read and heard about it, I was expecting much, much more. Maybe it just couldn’t live up to my expectations. Some reviews put this on par with the Rogue Chocolate Stout, but for my money this doesn’t even compare to the overall satisfaction that I got from the Rogue. (I have a review of the Rogue coming in the future). That being said, this beer is still very, very, very good and worth a try. I can see how this set the bar for others to be judged. I’ll pick it up again, no doubt!!!! Do you have a favorite Chocolate Stout? Again, thanks for reading and don’t be afraid to comment.